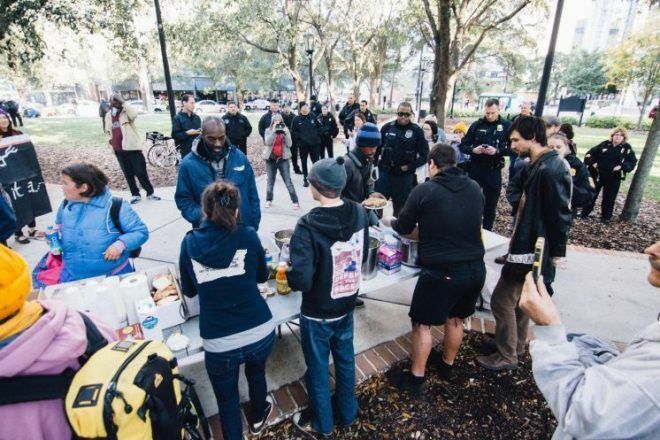 Seven people were arrested in downtown Tampa on Saturday simply for feeding the homeless. I went down to Gaslight Park on Saturday where Food not Bombs was doing its food share with hungry people in need. This organization has been doing a food share twice a week for about four years now. They pick up food from restaurants which would otherwise throw away pounds and pounds of food at the close of business to help hungry people get a meal. The FNB food share is an established practice such that those in need know where to go for some key missing nutrition. Well, this Saturday, perhaps due to the out of town crowds flocking to Curtis Hixon and/or a football field (the National Championship game is in Tampa this Monday), Tampa police swooped into the otherwise empty Gaslight Park and told the 6 people scooping out food on paper plates that if they didn’t stop, they’d get arrested for violating a city ordinance (16.43), for distributing food without prior written consent. Of course, the permits are expensive, and the city requires a million dollars worth of insurance for “events”; the red tape is meant to keep the homeless out of sight. There were at least 10 hungry people in line, who by the look of it were very much in need of some food, and so the food sharers continued to share. Seven people were arrested: 6 for scooping out food to the needy, and one man, who had come in need of food, who tried to eat once the 6 were detained. At issue is a section in the city’s code of ordinances that prohibits distribution of food to the general public without written approval from the city, said city spokesman Ashley Bauman. To use a city park for that purpose, a facility use permit must be obtained, which involves an application, potential fees and deposits, and liability insurance coverage of at least $1 million. Since then, the group hasn’t had any issues, Dunson said. But with thousands in town for the football championship, he said he believes the timing was intentional. “We felt action had to be taken because of the overwhelming and growing crowd in the park,” she said. Durson didn’t have a crowd count for this weekend’s event because it was cut off early and several people were there shooting video of the arrests, he said. But the group generally serves 20 to 25 people on Saturdays and roughly 10 more people than that on Tuesdays. And as for this Tuesday, he said, they’ll be back.